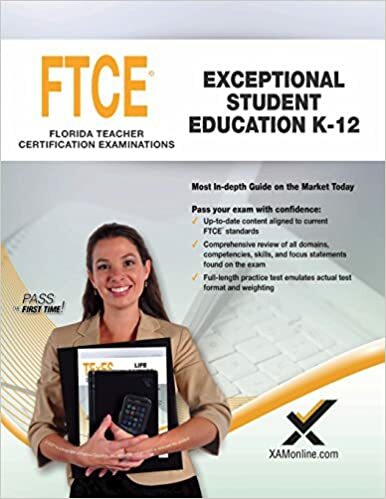 In addition to a comprehensive review of each of the seven core competencies, this study guide also includes information on FL state standards and the requirements for obtaining a teaching certificate in the state of Florida. You’ll have the ability to learn not only content specific to Exceptional Student Education (ESE), but also effective teaching strategies to use in your future classroom. Specific topics include: • Individuals with Disabilities Education Improvement Act • Individual Educational Plans (IEPs) • Confidentiality • Assessment • Intervention • Transition • Progress- monitoring • Research-based instructional practices • Effective classroom management • Behavior management strategies & intervention plans The sample test comes with an answer key, an organized table to show the difficulty of each question, and a detailed explanation for each correct answer. With an extensive review of the content area and teaching methods, detailed information about the test, and a practice test, this study guide is a must when preparing for your teaching certification in Florida.